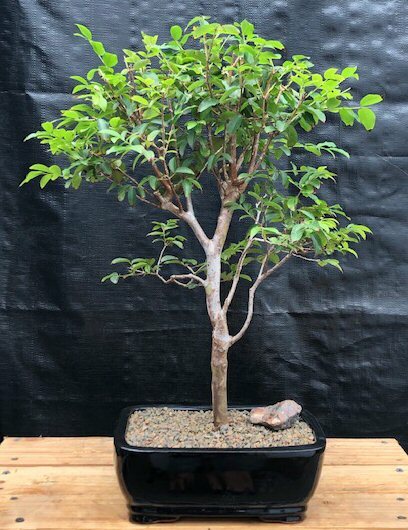 Native to southern Brazil the Jaboticaba, pronounced in five (5) syllables just as it is spelled, is a member of the Myrtle family and relative of the Guava. The botanical name "Cauliflora" means that it flowers and bears fruit on the trunk and mature branches. 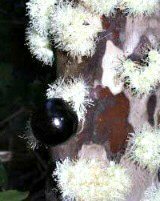 During it's flowering period the tree is covered in clusters of small white flowers all over the trunk and branches. These eventually develop into dark berries, which are sometimes sold in delicatessens. The kernels of the fruits can be grown as bonsai which make pretty indoor trees. The bark has a habit of peeling off in curls as the trunk and branches expand. Easy indoor care.